LACMA is one of our favorite destinations every day of the year, but around Halloween, it's especially close to the top of our list. The museum's popular annual Costume Ball often brings out some of the best and most creative costumes, and this year might top the lot—the theme of the party is "The Living Museum" and guests are encouraged to dress up "as a work of art." No, you did not wake up like this. Put in some effort and dress up like one of LACMA's must-see works of art. Or a lesser known masterpiece. Prizes will be awarded by a panel of soon-to-be-announced judges. Dance the night away to the sounds of Thug Entrancer and Oneohtrix Point Never, go see Haunted Screens: German Cinema in the 1920s and stay late for an after party in the galleries. There will be food sales and a cash bar until 1am. Please note this party is just for guests 21+. 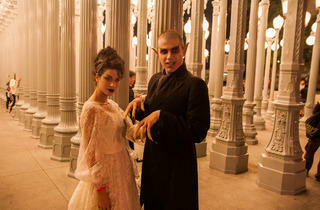 See our photos from the 2013 LACMA Costume Ball here.